Wouldn’t it be convenient if we could free up our day and increase our knowledge at the same time? What if we could delegate the tedious task of acquiring such knowledge to the otherwise unproductive state of sleep (a state that we nevertheless spend a third of our lives in)? The idea of sleep learning isn’t new and has made various appearances in popular culture – sometimes to hilarious effects, such as in Friends, Dexter’s Laboratory or The Simpsons, and sometimes in a more sobering fashion, such as in Aldous Huxley’s Brave New World. In a scientific context, however, it has been subject to almost as much debate as have the benefits (or lack thereof) of coffee (or wine, or coconut oil… you get the idea). The concept of sleep learning first gained popularity in the early 20th century, once the technology to record and play back sounds had been sufficiently developed. Some studies demonstrated what appeared to be promising effects: by having an audio tape with suitable content played back to slumbering subjects, they seemed to be able to learn Chinese or even stop biting their nails. However, this was debunked in the ‘50s when, by using recordings of electrical brain activity to monitor subjects’ state, it was discovered that any information retained had simply been presented in a state of (near) wakefulness – during actual sleep, nothing was memorized whatsoever. Nonetheless, interest – especially commercial – in the idea remained, with countless apps or websites promising you even nowadays to learn new languages or similar overnight, and claims about their effectiveness being brought forward from both sides of the field. Recently, there has been refreshed scientific interest in the idea, with a number of different approaches being pursued. But before we come back to the current progress in the field of sleep learning, we need a bit of background info on sleep itself. Although researchers still don’t have a complete understanding of why we sleep at all, it is commonly assumed that at least one important function is the processing and consolidation (storing) of information obtained during the day. At this point, one might want to distinguish between explicit (or semantic) information on the one hand – for example a vocabulary list – and implicit (or procedural) knowledge, such as the motion sequence necessary to do a backflip. 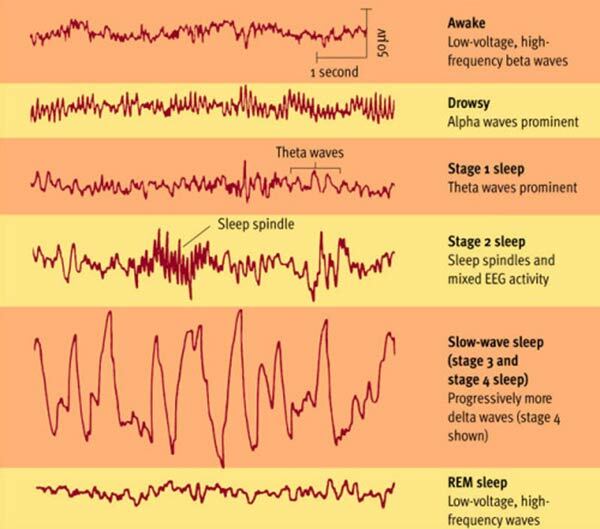 According to some theories, these different kinds of information are encoded during different stages of sleep: REM sleep, a stage of light sleep characterized by rapid eye movements, vivid dreams, lack of muscle activity and neuronal firing patterns resembling the waking state, might be important for the consolidation of implicit memories (although there is some controversy in this respect). Non-REM (or NREM) sleep, on the other hand, is the collective term for the remaining three stages of sleep: stage 1, a very light sleep often not recognized as such by the sleeper; stage 2, characterized by short, fast bursts of neuronal activity called sleep spindles; and stages 3 and 4 – very deep sleep also called slow-wave sleep or SWS. NREM sleep has been consistently linked to the consolidation of explicit or semantic knowledge. Thus, when it comes to studies focusing on the relation between sleep and memory, it is important to distinguish between these different sleep stages. With this in mind, we can come back to the question of sleep learning. Given that sleep is thought to be crucial for the formation of new memories, it doesn’t seem unreasonable to assume that this process could be influenced or enhanced in some way. As it turns out, researchers have found a way to do exactly that. Based on theory called active system consolidation which states that selected memories are replayed during sleep in order to process them, the possibility of targeting specific memories to be reactivated has been demonstrated. In an initial learning phase, subjects are trained to do a certain task, such as remembering word pairs or the location of objects on a grid. During this process, certain words or objects are tagged with a cue, usually a smell or sound. When subjects are exposed to this cue during sleep, processing of the associated memory is facilitated – leading to improved performance in the task for cued compared to non-cued objects. This paradigm, called TMR for targeted memory reactivation, has been replicated and extended multiple times. As a recent review claims, it has been successfully used to “improve visuospatial and verbal memories, strengthen motor skills, modify implicit social biases, and enhance fear extinction.” However, the authors go on, “these studies also show that results depend on the type of memory investigated, the task employed, the sensory cue used, the timing of the cue delivery, and the specific sleep stage of stimulation.” In fact, in order for this technique to work, the cues need to be presented during SWS or NREM2, highlighting the importance of NREM sleep for memory consolidation as indicated above. Furthermore, first results regarding the neuronal basis of TMR have linked it to an increase of sleep spindles during NREM2. At this point, it is tempting to focus entirely on the emerging possibilities of NREM sleep in sleep learning and neglect a possible role of REM sleep. However, one would be wrong to do so. In contrast to the studies targeting NREM sleep, in which existing knowledge is merely enhanced, the brain seems to be capable of processing and even retaining new information during REM sleep – although to a very limited degree. In a seminal study published last year, participants were exposed to differing sets of white noise fragments (a type of stimulus that could be processed automatically while still being rather complex) during wakefulness, REM and slow-wave sleep. Later on, they were given a discrimination task including the previous stimuli alongside new material. Performance was improved for stimuli encountered during REM sleep (as well as during wakefulness, of course), indicating that some kind of learning had taken place in these cases. However, there is currently no evidence to suggest that something similar might work for more meaningful stimulus material, due to the more complex level of processing required. To sum it up, whether or not sleep learning actually works depends on how exactly we define the term. Being taught new, in-depth knowledge from scratch during a nap won’t work; the sleeping brain simply isn’t able to process such complex information in the necessary ways. However, existing memories can be enhanced if their processing is facilitated by external cues during non-REM sleep, and even new (very basic) information can be absorbed when presented during REM sleep. Still, it is too early to get our hopes up for an effortless acquisition of knowledge in the future. It is far from certain whether these approaches will ever be established in a real-life setting and many other questions will have to be answered first. Does the strengthening of selected memories come at the expense of others, which are more easily forgotten in turn? Could these techniques even be abused to influence people against their will? For now, while watching and waiting for further progress in the field, it seems easiest to stick to the old-fashioned, established ways of sleeping and learning. You actually make it appear so easy together with your presentation however I to find this matter to be really something that I feel I’d by no means understand. It seems too complicated and very huge for me. I’m taking a look forward to your next put up, I will attempt to get the dangle of it!